Appearance: The macaroni portion seemed fine but did have a distinct "stale" aroma. The cheese sauce showed marked oil separation and some slight clumping/curdling but smelled and tasted fine. Result: The finished dish had a slightly "off" taste to it but otherwise looked and smelled close to normal. After Effects: Mild case of loose bowels for two days after consumption. That was not a fair test...everyone knows slow cooking a pot roast acts like a filter and renders any toxins delicious. manacheck: Sorry so late responding. The grease ants didn't seem to affect the flavor at all. My wife thought I was nuts. I"m slowly cleaning out my MRE emergency snacks which have traveled with me over many a hill and vale. I had MRE crackers and peanut butter from c. 2003-2005. The crackers were stale, very broken, and tasted like old flour. The peanut butter smelled like those Asian beetles which look like lady bugs, and was orange. I tossed it. I have eaten enough of those beetles to last me a lifetime. The crackers were also fed to my 14 month old daughter, who was not especially impressed, but accepted the offering. The outer clear plastic of the peanut butter was seperating from the brown plastic underneath , so that might have been a clue about quality & age. So...the peanut butter really does have an expiration date. I"m learning one needs to clean out their MREs from time to time. People can say "I have an MRE from the 80's and I"ll eat it when I'm hungry" but I have to say there are some real limits on that stuff. No discernable difference from a fresh box. Looked, smelled, tasted fine. 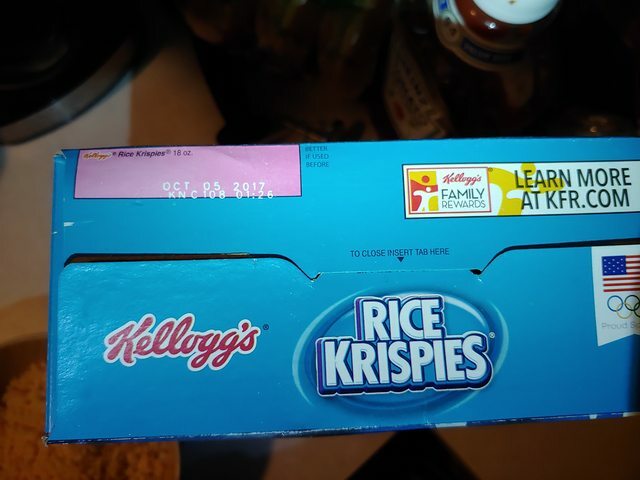 And yes, this was an opened box in my pantry, with the inner bag clipped shut. Looked fine but the taste is very "off". Then again, my wife says it smells fine to her and I have the flu/crud/cold/allergies, so it could be my taste buds that are weird. Cottage cheese in work fridge. Smell almost made me start gagging when I opened the door to the room. I opened the container to make sure that's what the smell was. I didn't taste the actual product. Does tasting the smell count?